Owner Eric Holsinger working at OBXDIY. Makerspace: A creative, do-it-yourself place where people can gather to create, invent and learn. It can often include high-tech equipment such as 3-D printers, software, electronics, craft and hardware supplies. Also known as hackerspaces, hackspaces and fablabs. 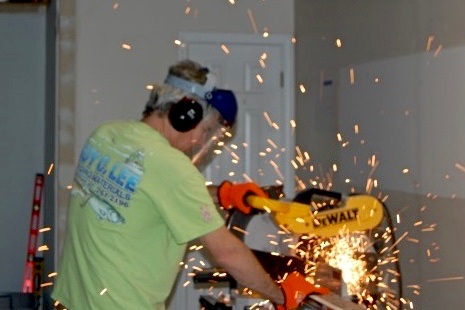 OBXDIY: The first makerspace on the Outer Banks. If you keep up with tech magazines such as Wired, you’ve probably heard about these new cooperative endeavors, hailed as a possible new source of innovation and entrepreneurial progress, particularly in rural and inner city areas where traditional education and manufacturing facilities are in short supply. Which is why a small sign over a strip center doorway caught our eye a few weeks ago. Coincidentally, that same week, Eric Holsinger, whose business card proclaims his title as Curator of Chaos at OBXDIY, reached out to the Voice via Facebook. Before we sat down for the interview, Holsinger presented me with a small, green sphere, copied from NASA software that he created on OBXDIY’s 3D printer. By day, Holsinger is one of a growing number of Outer Banks residents who telecommute via computer for larger companies scattered across the nation and the world. Holsinger designs high tech parts and products. As a designer, the makerspace idea drew Holsinger in, and OBXDIY was started as an avocation for him — not a full time job. 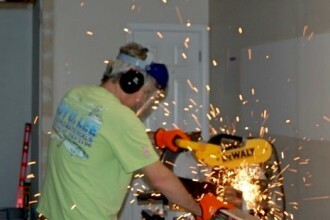 But OBXDIY is set up differently than other makerspace facilities. OBXDIY is in Kitty Hawk. 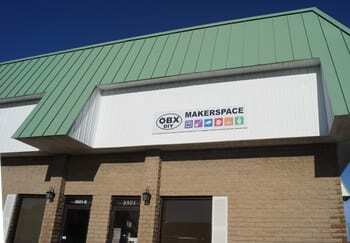 Rather than existing as a dedicated technical production facility, OBXDIY combines a small business co-op with the makerspace function for a very practical reason: It helps pay the bills. “Our concept was to roll in here and first and foremost figure out a way to pay the bills because we have rent to pay,” he said. So, downstairs they rent out offices that range in size from 12’ x 12’ to 12’ x 14’ to small businesses. The rent ranges from $250-$350 per month and early tenants included Silicon Travel and CMIT Solutions, both tech companies, are two of the early renters and several spaces are still available. In fact, two will become available in May. A second component of the co-op side is a membership in OBXDIY, which gives small businesses and groups that do not require a day-to-day physical space a place to meet or hold events. This side of the endeavor has taken off, led by Kim Twiddy. Some current members include Little Wildflower Art Studio, Outer Banks Entrepreneurs, and the Mustang Music Outreach Program. Members pay $65 a month for four hours of meeting time in the upstairs common area, perfect for small business efforts such as art, music or wine tasting classes, meeting areas for groups such as the Outer Banks Entrepreneurs, or events such as a small craft show. Holsinger credits Twiddy, who is the General Manager of the Small Business Co-op side of OBXDIY with ramping up this program in a big way and allowing very small businesses to have a place to meet, plan, work with other small business owners and grow their businesses. The rented space merely helps OBXDIY pay their rent and perhaps have some funds left over to help the makerspace. The makerspace side is proving to be a bit more challenging and Holsinger is hoping this article and other PR moves will raise awareness and participation in this collaborative and creative process. For the actual makerspace side, we asked Holsinger to walk us through how a makerspace idea might work. Holsinger starts with the basics; a makerspace is made up of individuals and teams of collaborators who have specialized skills in areas such as programming, designing, fabrication, engineering, electronics—all of the skills that go into making a typical product. Next, makerspaces try to purchase workplace equipment to help those with ideas for products to design, model and even 3D-print a small scale working prototype. Examples of the type of equipment often found in a makerspace facility include 3D printers, computers for modeling products, Computer Numerical Control (CNC) machines and routers, and laser cutters as well as a clean room environment. 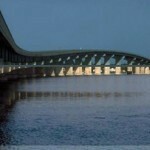 Holsinger then conjures up a hypothetical business idea where OBXDIY could assist. “Let’s say you own one of those aluminum portable cooler systems with rod holders and such and you really love it. But you decide it would be an even better device if you could add a compartment for your bait and keep it cool using ice or a cold pack. You come to us with the idea. Now, we aren’t going to design and build this thing for you. We’ll talk, and you’ll have to demonstrate to us that you are willing to learn enough—some programming and modeling skills for example– such that your collaboration is equal to the others helping you. So, we take your idea and put it to paper or a whiteboard, then we model it in 3D on a computer where we decide on the dimensions, the materials, work out the costs, and the mechanics of the actual device. Then we use the 3D printer to make a small scale version of your product to see if it all the parts work as they are supposed to, and if they don’t, we go back and tweak it on the computer and print a new prototype. Before 3D printers came along (and OBXDIY made their own printer as their first project! ), a prototype would require an inventor to find a facility with an injection mold and a single prototype might costs tens of thousands of dollars—an expensive way to discover a product needs some tweaks. By contrast, 3D printer prototypes cost pennies to produce. So what does OBXDIY need to succeed? A first step would be more volunteer “experts” to join and help potential inventors bring their products to market. And of course, people are needed who will bring ideas to OBXDIY. Right now, there are two working groups that are more hobbyists than commercial product developers. Those two groups are working to improve their skills in 3D printing and 3D computer modeling. In fact, hobbyists and those wishing to bring a product to market are both encouraged to join the OBXDIY effort. Also, Holsinger wanted to emphasize that the makerspace function is not exclusively devoted to high-tech product design. For example, a team is working on a new Stand-Up Desk System as well as an automated, self-sustainable Green Wall System for plants and edibles. Even though something like a desk is not a high-tech device in the same way as a smart phone, high tech tools such as computer software and computer controlled routers are employed in designing and prototyping potential products. OBXDIY is not a school nor is anyone being paid to design, invent or manufacture a product. It is truly a collaborative effort where the “newbie” with an idea is expected to roll up his or her sleeves, join a team and contribute the largest portion of the effort required to get a product from the idea stage to the prototype stage. The facility is located at 3901 N. Croatan Highway, on the corner north of the Kitty Hawk post office.